Selling a Home in the South Okanagan? Selling a home in the South Okanagan market can be challenging- we at CRUSH Real Estate Group understand that. While the market can be a bit overwhelming, hundreds of homes and businesses are sold each month in Penticton and the South Okanagan. What’s the difference between selling your home or failing to do so? The Details. Whether it’s our proven sales approach, effective marketing campaigns or utilizing our existing network, with CRUSH Real Estate Group no detail is overlooked. How Long Will it Take to Sell My Home in the South Okanagan? That is THE QUESTION, isn’t it? There are three main factors that affect a property’s time on the market in Penticton and the South Okanagan: location, condition, and price. Location is the one thing that you cannot control in the home selling process. In conjunction with condition and price, people choose a home based on the location and accessibility of the property. In many cases, homes will sell faster in desirable neighborhoods because the demand is high. Take into consideration what the demand is to live in your neighborhood. 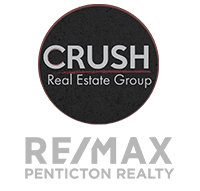 Crush Real Estate Group can provide information on yours and surrounding Penticton and South Okanagan neighbourhoods to help you assess this factor. The condition of your property is also a major contributing factor to the time it will take to sell. When evaluating a home in the South Okanagan, buyers will first assess the structural condition of items such as walls, ceilings, floors, doors and windows. They will want plumbing and electricity to work efficiently. They will then consider paint, carpets and floor coverings. The front and back yards should be in reasonably good shape. If there is major damage or deterioration to any of these items, buyers will likely hesitate in making an offer. Crush is happy to discuss ways to cosmetically improve your South Okanagan home for a more rapid sale. Pricing your property to sell in the South Okanagan’s current real estate market is absolutely crucial. Obviously, the condition and location of your property should be a major consideration when deciding on a price. If your home is priced too high, it will likely remain on the market longer, resulting in a lower final sales price. Y can guide you on appropriately pricing your property for the shortest listing time with maximum profits. Is there a surplus of homes for sale in your area? Are technology tools and networking resources being utilized to market your property? Are your closing terms favorable to buyers? Crush will be able to coach you in dealing with each of these things to ensure the quickest possible sale. Unfortunately, there is no magic time frame when it comes to selling real estate in the South Okanagan. Some Penticton properties sell before a sign hits the front yard, and others may sit for months before the first offer comes in. We can provide you with the average days on the market for properties that have recently sold in your neighborhood; however it is important to remember that the variables affecting this data are not detailed in these comparables. Crush can help you with this as we have viewed a majority of the properties included in the comparables and can give you a better idea of why a specific property sold in the time frame recorded. Are You Priced To Sell Your South Okanagan Home? Urgency. How quickly must you sell your home? Competition. Are there just a few or many homes available in your price category and area of the South Okanagan? Competitive Market Analysis. Do you know what similar homes in the South Okanagan sold for within the last six months? Original Cost. Your price is determined by today’s real estate market. Neighbour’s Claims. Don’t listen to what your neighbours tell you is the fair market value for you home. Other homes in your South Okanagan neighbourhood may not be as similar as you think. Also the terms accepted by both the buyer and seller greatly affect the sale price. Look To Qualified Real Estate Professionals like Crush When You Need Answers Fast! As you can see, there are a multitude of factors that determine the asking price of your South Okanagan home. Finding this price yourself can be a long and difficult task. That is why hundreds of satisfied homeowners, turn to a residential specialists like the team at Crush Real Estate Group. As South Okanagan residential specialists, we have the tools necessary to compute the fair market value of your house quickly and accurately while allowing for personal considerations (such as the date by which you must sell). We look forward to confidently answering your questions about listing, pricing and showing. To get you the most money for your home as possible. To sell your South Okanagan home as quickly as you can. Now that you have made the decision to sell your home, it is time to determine its asking price. Since the procedure by which it is calculated can be somewhat complex, you will want to seek the guidance of a trained professional Realtor® like the team at Crush Real Estate Group. Should you price your South Okanagan home too low, you could potentially cheat yourself out of thousands of dollars. Conversely, if you price your home too high, potential buyers will bypass it in favor of something more reasonably priced. Leaving your home on the market for too long could have the adverse effect of giving it an unfavorable reputation. The object is to choose a price that is neither too high, nor too low. The asking price should be both accurate, given its market value, and fair. With over a decade of South Okanagan real estate experience, the team at Crush is familiar with the market and all of its changes. Take advantage of their knowledge and expertise! Market value is the highest price that a willing buyer and seller, not under any compulsion or outside pressure, agree upon. Determined by outside influences, such as social and political factors, as well as the economy, market value is the price that your home should sell for in the current market. Your home’s fair market value depends on a number of other factors including, how it was built, its location, the condition it is in, the size of both the house and the property it sits on, as well as the price of other similar homes that have recently sold in Penticton and other areas in the South Okanagan. The price you choose will also be determined by the tempo of the market, the public’s confidence in the current economy, and competition within the South Okangan market. Ultimately, the market will determine the value of your home, not you, making the services of a trained professional who understands it and all of its complexities all the more worthwhile. Don’t hesitate to ask us any questions you may have – our collective knowledge could save you thousands of dollars. Do Home Improvements Affect the Value of my Home in the South Okanagan? All it takes is a simple 5×9 foot extra bath to make mornings more civilized for most families. But don’t count on a return on extras like a heat lamp or whirlpool tub. Outdoor living space is a desirable asset, especially in the South Okanagan. No maintenance decking material leaves lots more leisure time, too. Once you have made the decision that you want to sell your South Okaganan home, a shift in the perception of how you view your home will make it a lot easier for you to make smart decisions when it comes to setting a price, getting your home show-ready, and dealing with offers as they start to come in. Remember, how you see your home (filled with many fond memories) and the way a potential Buyer sees your home, are likely to be two very different scenarios. Walk through your home with an objective eye, and pretend that you are a potential Buyer. How does your home feel? Are there things that need to be done prior to hosting viewings with potential Buyers? Is there anything that will make your home stand out from the rest? Now is the time to capitalize on your investment! Buyers prefer homes that are well-maintained, clean and clutter-free—homes they can picture themselves living in. Taking the time to prepare your home will boost your home’s saleability and sale price. Your entrance needs to be inviting – clear shoes, coats, purses and school bags so that people can easily get in your house. Too much furniture makes rooms seem small. Store extra furnishings off-site. Brighten rooms by installing high wattage light bulbs. Remove from your counters – we want them to look as spacious as possible. But don’t just jam all that stuff in your cupboards – we need them to be clean and de-cluttered too. People will look inside your fridge. They’ll comment on how clean your oven is and guess as to how often you cook. Clean your appliances the same way you did the first time you had your in-laws over for dinner. Organize Closets – overstuffed closets give buyers the impression that your home doesn’t have enough storage. Bathrooms Put away your shampoo, deoderant and toothbrushes – no one wants to look at them. Mirrors, counters and bathtubs should literally sparkle. New towels and a shower curtain can go a long way too. And keep your toilet clean – you’d be surprised how many kids have to use the bathroom while their parents are looking at houses. While you may have ignored that leaky faucet or loose door knob for the last 2 years, now is the time to fix everything. Perform necessary minor repairs and touch-ups throughout the house. Neutral-colored fresh paint can go a long way to brightening up a room. At minimum, touch-up existing dings and scratches. Magic Eraser really is magic, so buy a Costco-size box and go at it. Deep-clean your home – from dusting under knick-knacks to deep-cleaning floors and shampooing carpets; yes this does mean actually moving furniture. Spruce up the landscaping – trim the hedges, the edges and pull the dandilions. Recoat the driveway and put urns with seasonal plantings at the front entrance. Count on CRUSH to sell your business or home in the South Okanagan at the best possible price with the least amount of stress! Tell us about your property!